A belated report on my December 22 observations. December 22 was a clear, albeit moonlit night. 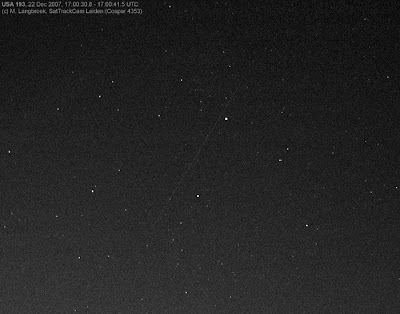 Three objects were captured: Lacrosse 3 (97-064A), Lacrosse 5 rk (05-016B), and the failed reco satellite USA 193 (06-057A), which was the highlight of the evening. In addition, a stray was captured in one of the USA 193 images, which turned out to be the Russian Okean-O rk (99-039B). USA 193 made a high pass. Bright and very fast due to it's low altitude, it was a spectacular appearance. It was over 20 seconds early relative to Mike's elset 07352.74304755. 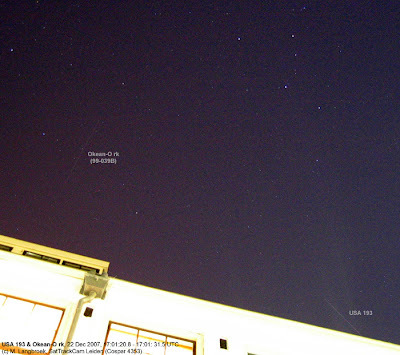 Below two pictures: the first showing it zipping through Cygnus (passing close to Deneb); the second showing it didappear behind the roof, with the Okean-O rk captured in the same image as a stray. Cassiopia is at top right.